Home of the Lake Smith Terrace, Haygood Point, and Governor Square Civic League. Samhain/Calan Gaeaf marked the end of the harvest season and beginning of winter or the 'darker half' of the year. Like Beltane/Calan Mai, it was seen as a liminal time, when the boundary between this world and the Otherworld thinned. This meant the Aos Sí (/iːsˈʃiː/ eess-SHEE), the 'spirits' or 'fairies', could more easily come into this world and were particularly active. Most scholars see the Aos Sí as "degraded versions of ancient gods [...] whose power remained active in the people's minds even after they had been officially replaced by later religious beliefs". The Aos Síwere both respected and feared, with individuals often invoking the protection of God when approaching their dwellings. At Samhain, it was believed that the Aos Sí needed to be propitiated to ensure that the people and their livestock survived the winter. Offerings of food and drink, or portions of the crops, were left outside for the Aos Sí. The souls of the dead were also said to revisit their homes seeking hospitality.Places were set at the dinner table and by the fire to welcome them. The belief that the souls of the dead return home on one night of the year and must be appeased seems to have ancient origins and is found in many cultures throughout the world. In 19th century Ireland, "candles would be lit and prayers formally offered for the souls of the dead. After this the eating, drinking, and games would begin". Throughout Ireland and Britain, the household festivities included rituals and games intended to foretell one's future, especially regarding death and marriage. Apples and nuts were often used in these divination rituals. They included apple bobbing, nut roasting, scrying or mirror-gazing, pouring molten lead or egg whites into water, dream interpretation, and others. Special bonfires were lit and there were rituals involving them. Their flames, smoke and ashes were deemed to have protective and cleansing powers, and were also used for divination. In some places, torches lit from the bonfire were carried sunwise around homes and fields to protect them. It is suggested that the fires were a kind of imitative or sympathetic magic – they mimicked the Sun, helping the "powers of growth" and holding back the decay and darkness of winter. In Scotland, these bonfires and divination games were banned by the church elders in some parishes. In Wales, bonfires were lit to "prevent the souls of the dead from falling to earth".Later, these bonfires served to keep "away the devil". On All Hallows' Eve, Christians in some parts of the world visit cemeteries to pray and place flowers and candles on the graves of their loved ones. 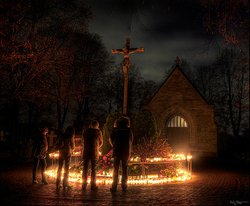 The top photograph shows Bangladeshi Christians lighting candles on the headstone of a relative, while the bottom photograph shows Lutheran Christianspraying and lighting candles in front of the central crucifix of a graveyard. It is claimed that in the Middle Ages, churches that were too poor to display the relics of martyred saints at Allhallowtide let parishioners dress up as saints instead. Some Christians continue to observe this custom at Halloween today. Lesley Bannatyne believes this could have been a Christianization of an earlier pagan custom. 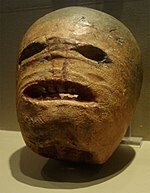 While souling, Christians would carry with them "lanterns made of hollowed-out turnips". It has been suggested that the carved jack-o'-lantern, a popular symbol of Halloween, originally represented the souls of the dead. On Halloween, in medieval Europe, fires served a dual purpose, being lit to guide returning souls to the homes of their families, as well as to deflect demons from haunting sincere Christian folk. Households in Austria, England and Ireland often had "candles burning in every room to guide the souls back to visit their earthly homes". These were known as "soul lights". Many Christians in mainland Europe, especially in France, believed "that once a year, on Hallowe'en, the dead of the churchyards rose for one wild, hideous carnival" known as the danse macabre, which has often been depicted in church decoration. Christopher Allmand and Rosamond McKitterick write in The New Cambridge Medieval History that "Christians were moved by the sight of the Infant Jesus playing on his mother's knee; their hearts were touched by the Pietà; and patron saintsreassured them by their presence. But, all the while, the danse macabre urged them not to forget the end of all earthly things." This danse macabre was enacted at village pageants and at court masques, with people "dressing up as corpses from various strata of society", and may have been the origin of modern-day Halloween costume parties. The modern imagery of Halloween comes from many sources, including Christian eschatology, national customs, works of Gothic and horrorliterature (such as the novels Frankenstein and Dracula) and classic horror films (such as Frankenstein and The Mummy). Imagery of the skull, a reference to Golgotha in the Christian tradition, serves as "a reminder of death and the transitory quality of human life" and is consequently found in memento mori and vanitas compositions; skulls have therefore been commonplace in Halloween, which touches on this theme. Traditionally, the back walls of churches are "decorated with a depiction of the Last Judgment, complete with graves opening and the dead rising, with a heaven filled with angels and a hell filled with devils", a motif that has permeated the observance of this triduum. One of the earliest works on the subject of Halloween is from Scottish poet John Mayne, who, in 1780, made note of pranks at Halloween; "What fearfu' pranks ensue! 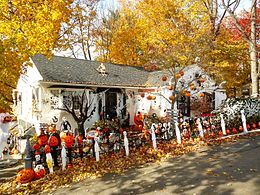 ", as well as the supernatural associated with the night, "Bogies" (ghosts), influencing Robert Burns' "Halloween" (1785).Elements of the autumn season, such as pumpkins, corn husks, and scarecrows, are also prevalent. Homes are often decorated with these types of symbols around Halloween. Halloween imagery includes themes of death, evil, and mythical monsters. Black, orange, and sometimes purple are Halloween's traditional colors. If you encounter any problems, or need help with this site, please email the webmaster.